It looked like it was all over for the Massachusetts football team late in the fourth quarter, as it trailed by two touchdowns and was facing a fourth and 12 at the Liberty 38. That’s when quarterback Ross Comis threw a strike over the middle to Sadiq Palmer, who made a pair of Liberty (4-4) defenders miss on his way to a 27-yard reception. That play would breathe life into a UMass (4-6) squad that was on its last leg, as Comis would scramble in from six yards out two plays later to narrow the Liberty lead to seven with 6:42 remaining. After getting a defensive stop, Comis led a 10 play, 75-yard drive that would end with a Marquis Young touchdown run with 25 seconds remaining to send the game to overtime, where the Minutemen would eventually come out with a 62-59 victory. The overtime saw both team’s offenses clicking, and it would come down to who could make the one stop on defense. The Flames opened with the football, where they would need just two plays before Frank Boyd ran one in from five yards out to put the pressure on the Minutemen offense. 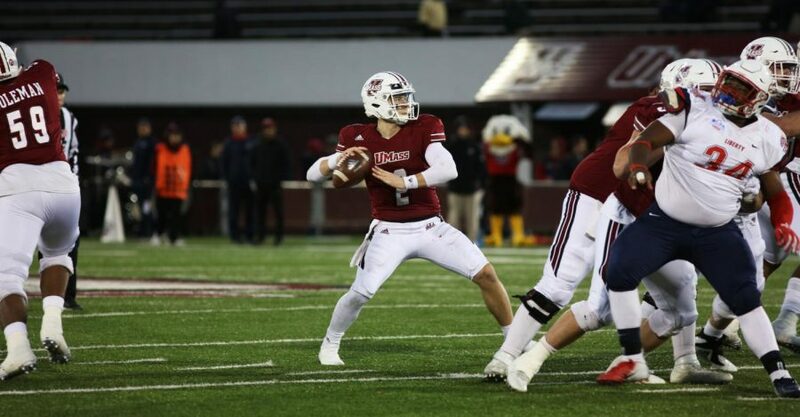 UMass would answer with a touchdown of its own, as Comis found a wide open Samuel Emilus who sprinted into the end zone to send the game to a second overtime. Emilus would score yet another touchdown for the Minutemen in the second overtime, but once again Liberty had an answer, as Frankie Hickson powered it in from two yards out to keep the game going. In the third overtime, Flame quarterback Stephen Calvert was looking to add another touchdown to the scoreboard, but Jarell Addo had something else in mind. The senior linebacker sprung in the air, leaping and snagging the football to give UMass the game changing turnover they desperately needed. Cooper Garcia would make a 22-yard field goal on the next possession to seal the win for the Minutemen. UMass finished with 777 yards of total offense, good for a school record. Comis would finish with 540 yards and four touchdowns through the air, 303 of those yards coming from Andy Isabella, which was another school record. Isabella added two long touchdowns in the first half, the first coming on a streak over the middle where he outraced the defense to go 89 yards untouched into the end zone. The second was a screen pass where he once again used his speed to get past the defense for a 61-yard score. Marquis Young would lead the Minutemen with 150 yards on the ground, while Comis also contributed 82 yards rushing. “I just kept saying ‘we have time, guys,” Comis said of the comeback. “These guys believe in me, they trust what I say and when I keep my spirits high, it helps everyone else out. Andy made some plays in the first half that kept it going and they trusted it was going to keep working. For Liberty, wide receiver Antonio Gandy-Golden had his way with the UMass secondary, using his 6-foot-4 frame to snag nine catches for 205 yards and a pair of touchdowns, including an acrobatic one-handed catch on the sideline. The Minutemen are back in action next week, traveling to Gillette Stadium to take on Brigham Young.